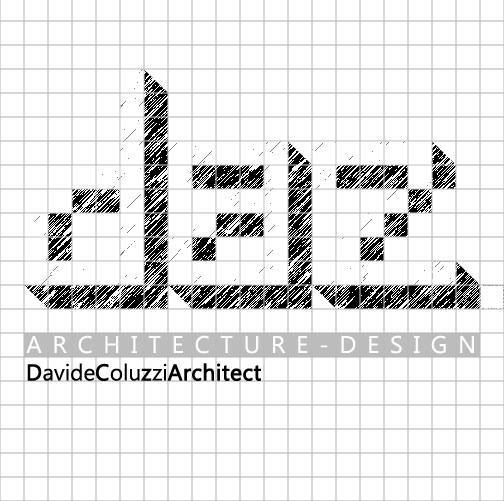 team: Davide Coluzzi DAZ architect, Savio Doronzo architect, Giulio Patrizi designer. 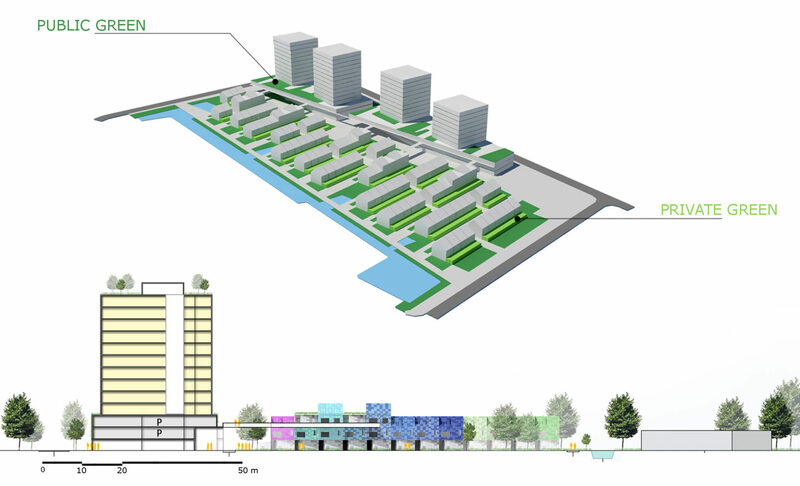 The city of Capelle aan den Ijssel presents an interesting urban layout situation. Here middle-sized architectures coexist with towers of considerable size (hoven1) and houses with access from the road, like in the northern district of the study (…. 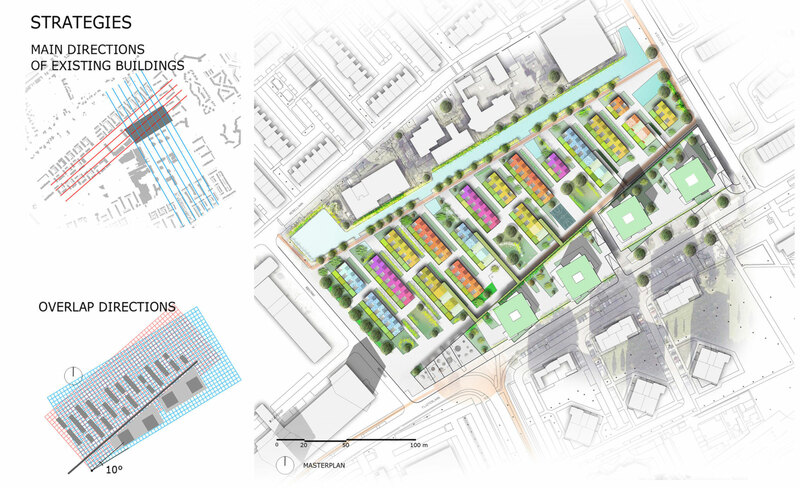 ), communication ways enclose the lots onto themselves, there aren’t important connections between the inhabitants because of the lack of few openings to the city center and the nearby metro station. The district has a tremendous amount of parks and water, but lacks a rationalization of these resources, there is no integrated system of maintenance among the residents, the trend is: private management and public use. 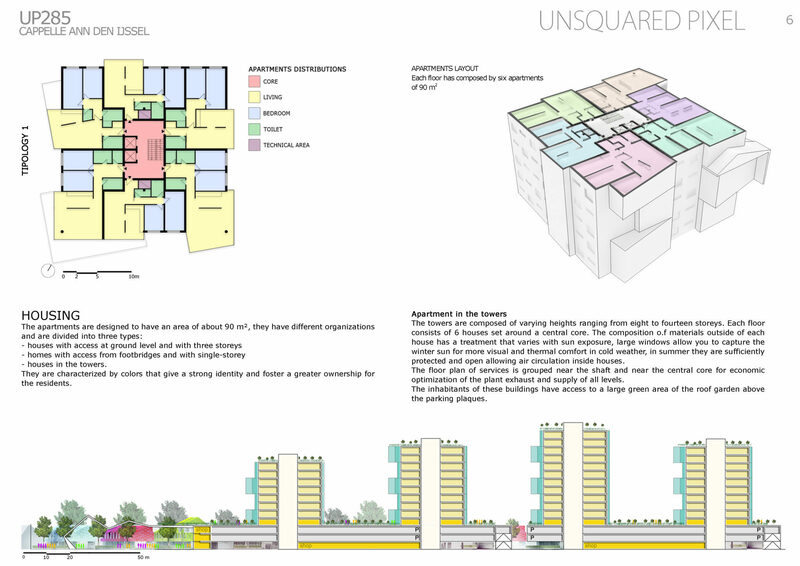 Unfortunately, the spaces are too large for the private management of paths and courtyards where you highlight the aesthetic and social degradation. The cars have a dominant role in the town scenario and hide the pedestrian and cycle paths. 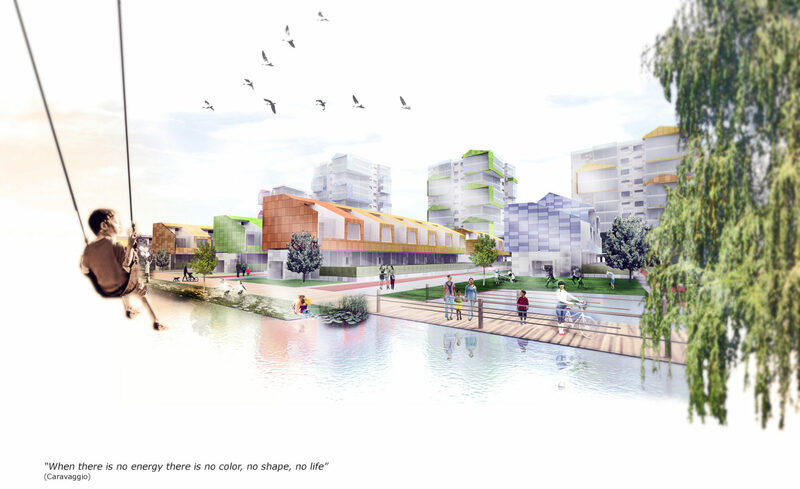 Capelle aan den IJssel is a city that has mass-produced settlements and architectural quality obsolete following a fixed pattern with low permeability between collective spaces. 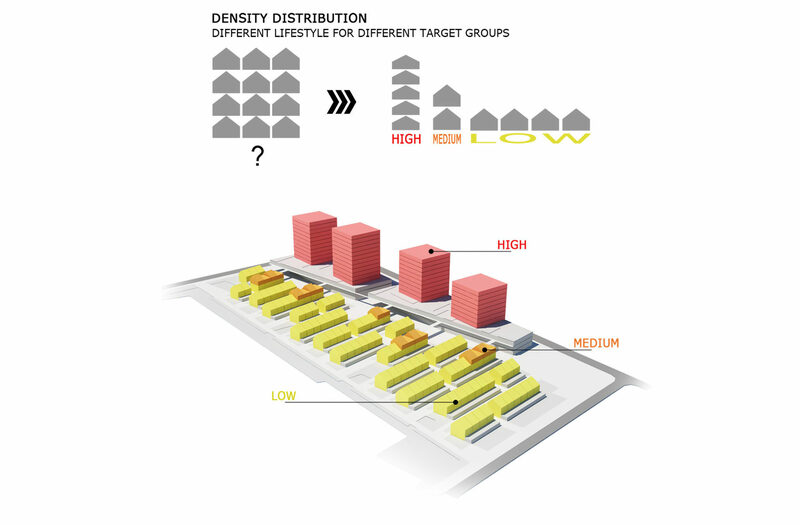 The new settlements of Hoven 1 are characterized by high density with tall buildings up to 16 stories high, located on a strip of parking lots and a shopping area, the new city district is open to the town, but doesn’t communicate with the residential neighborhood of low houses . Hoven 1 towers have a rotation to the south side to increase the solar energy, but a lack of green space, provides a partial permeability. The aim of the new complex is to give the city a very dense residential area, with about 85 units per acre with a high percentage of households with access to ground level and a proper balance between public and private spaces. 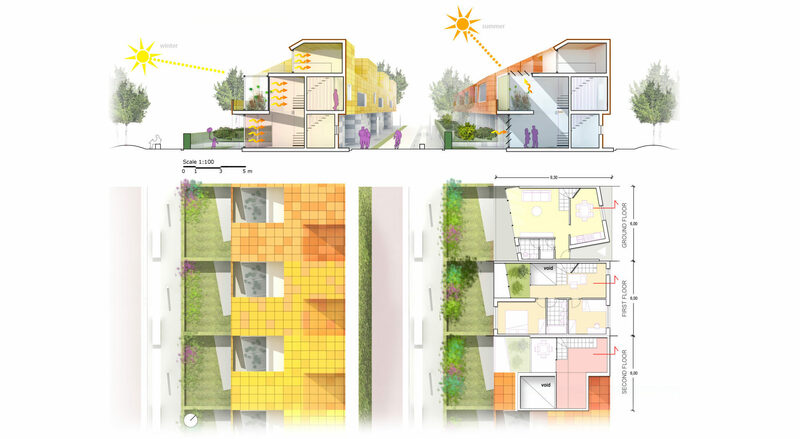 The new system seeks to increase the density of habitation on the ground floor with the occupation of areas degraded by creating green homes, privately owned gardens alternating with common green areas. 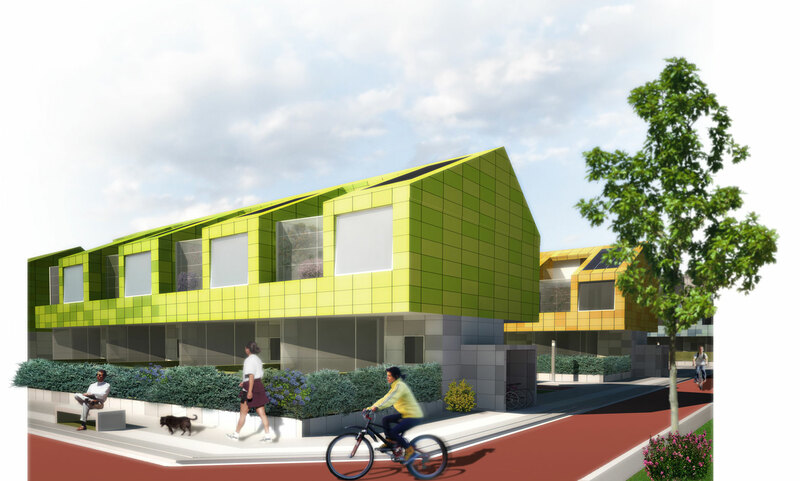 The houses take into consideration the people’s lifestyle, allowing a comfortable life thanks to the projection of a viable system for pedestrians and transportation with the complete removal of vehicles. The street front on the way —- it is considered as a city landscape, is made up of towers and parking raised in connection with the buildings of Hoven 1. Greenery subtracted from the new plant is shifted with roof-top garden on the roof of the parking lots designed as an urban park. 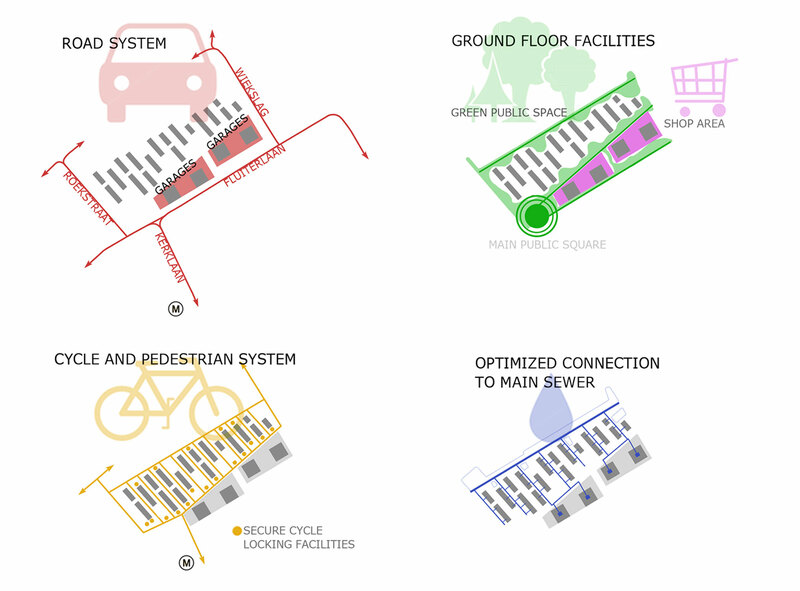 The entire complex on the road, hosting services for the community and commercial areas in relation to Fluiterlaan and the metro station. 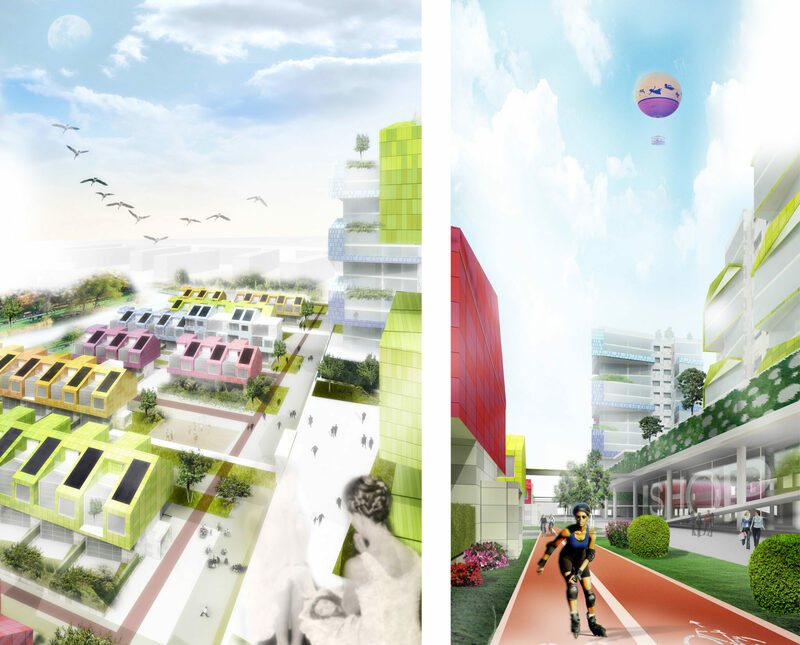 Hoven 2 Is considered both a place that welcomes different targets by age or by certain needs through a study of the various housing systems: 2 storyes small houses, single-story small houses and apartments in the towers. The different typology of life are based on the inhabitants various lifestyles, but everybody has a good quality of life. 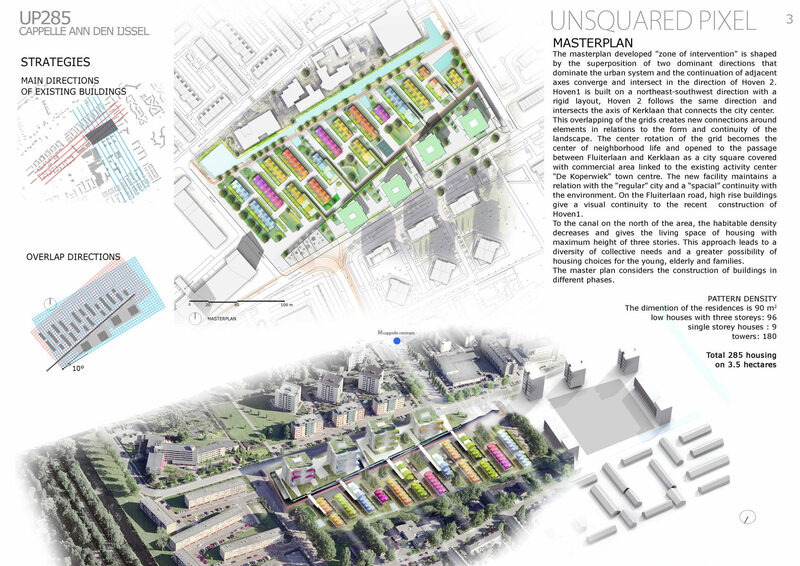 The masterplan developed “zone of intervention” is shaped by the superposition of two dominant directions that dominate the urban system and the continuation of adjacent axes converge and intersect in the direction of Hoven 2. 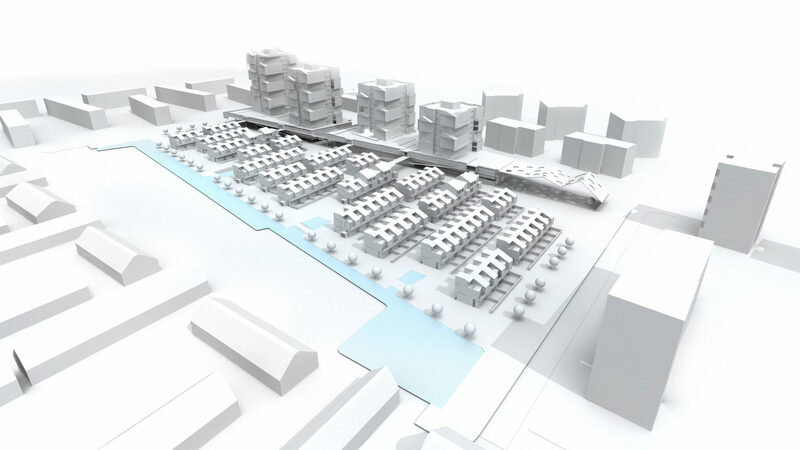 Hoven1 is built on a northeast-southwest direction with a rigid layout, Hoven 2 follows the same direction and intersects the axis of Kerklaan that connects the city center. This overlapping of the grids creates new connections around elements in relations to the form and continuity of the landscape. 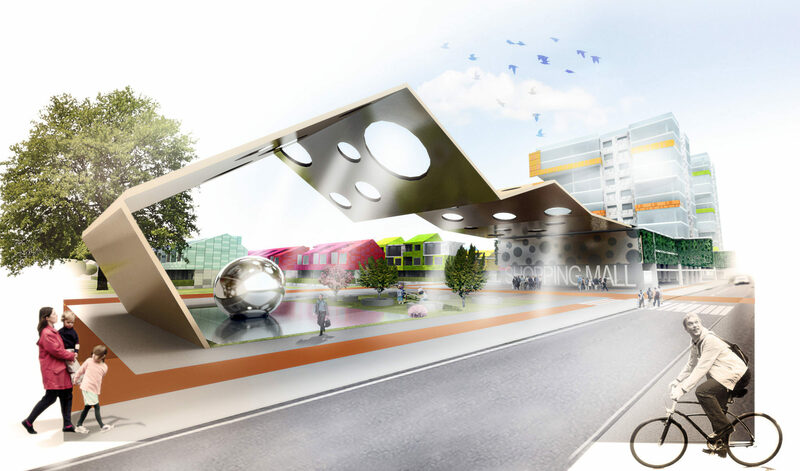 The center rotation of the grid becomes the center of neighborhood life and opened to the passage between Fluiterlaan and Kerklaan as a city square covered with commercial area linked to the existing activity center “De Koperwiek” town centre. 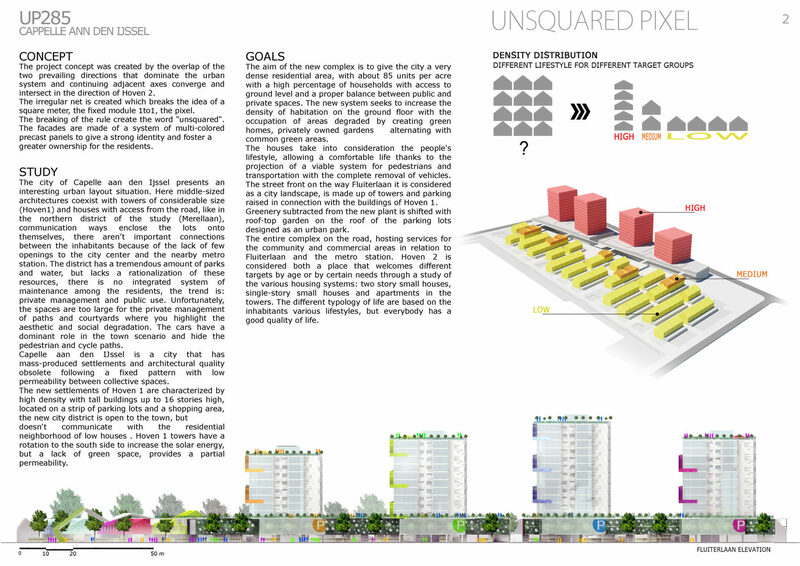 The new facility maintains a relation with the “regular” city and a “spacial” continuity with the environment. On the Fluiterlaan road, high rise buildings give a visual continuity to the recent construction of Hoven1. In a second phase, toward the canal on the north of the area, the habitable density decreases and gives the living space of housing with maximum height of three storyes. 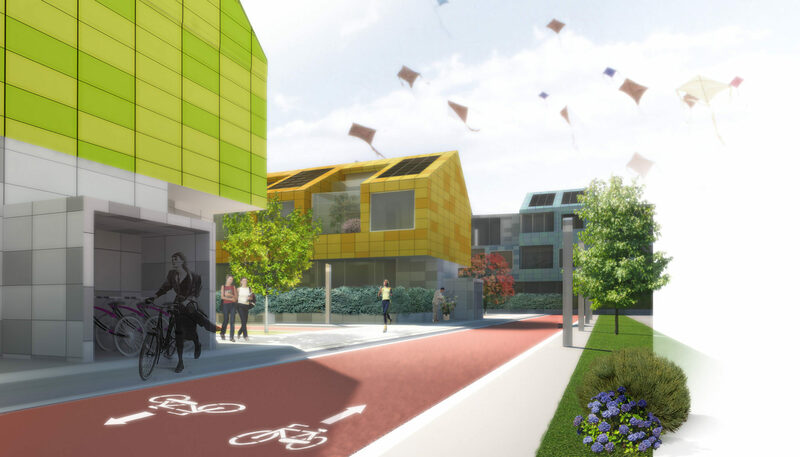 This approach leads to a diversity of collective needs and a greater possibility of housing choices for the young, elderly and families. 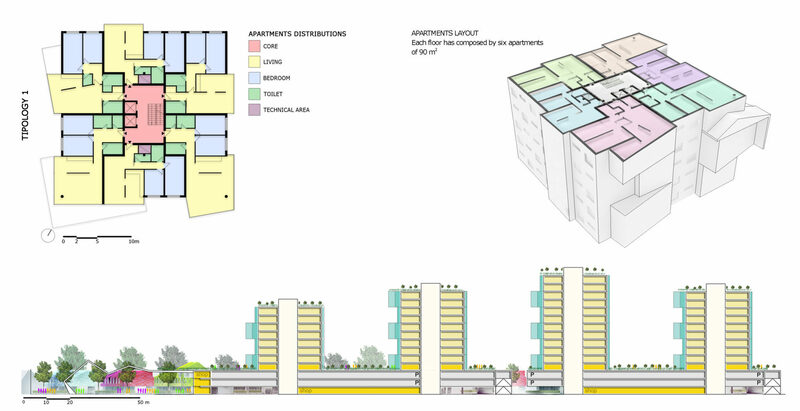 The master plan considers the construction of buildings in different phases. Houses with access at ground level. houses in the towers. 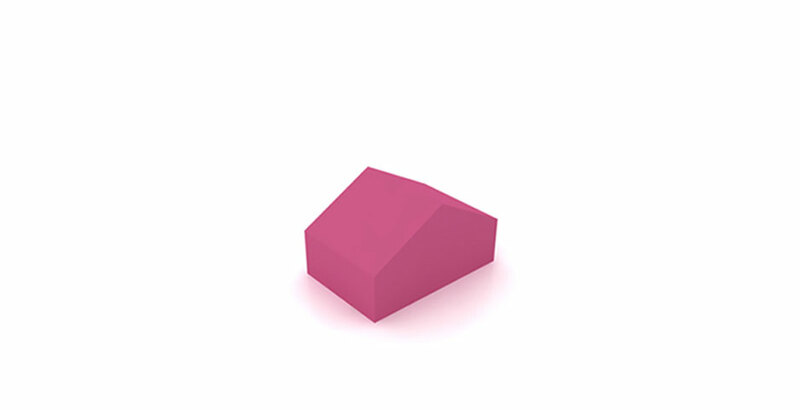 They are characterized by colors that give a strong identity and foster a greater ownership for the residents. The towers are composed of varying heights ranging from eight to fourteen storeys. 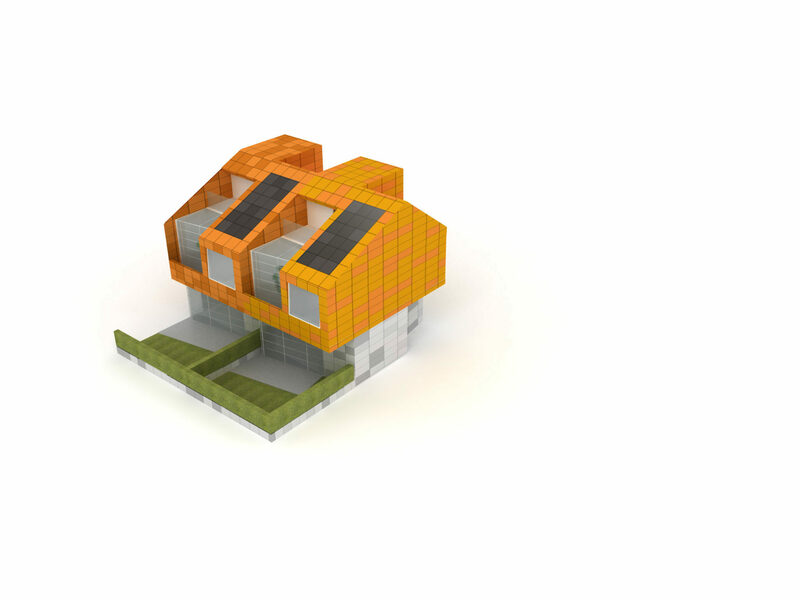 Each floor consists of 6 houses set around a central core. 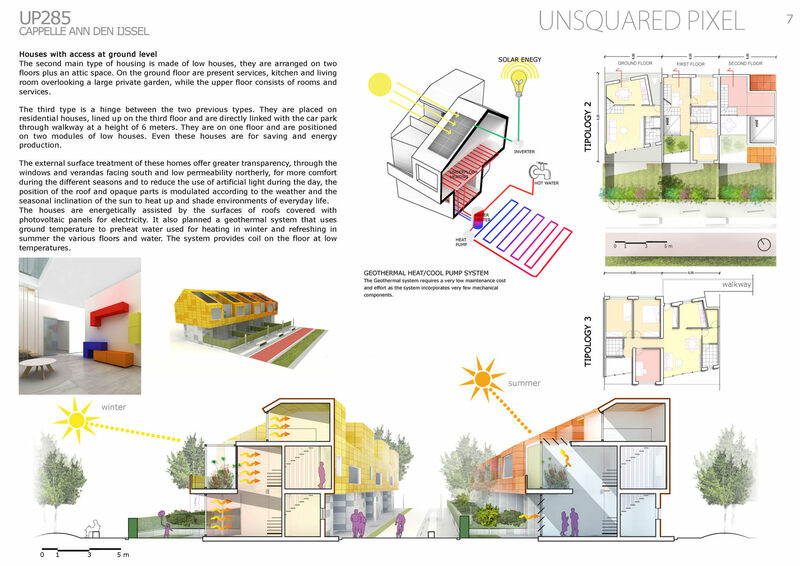 The composition of materials outside of each house has a treatment that varies with sun exposure, large windows allow you to capture the winter sun for more visual and thermal comfort in cold weather, in summer, they are sufficiently protected and open allowing air circulation inside houses. 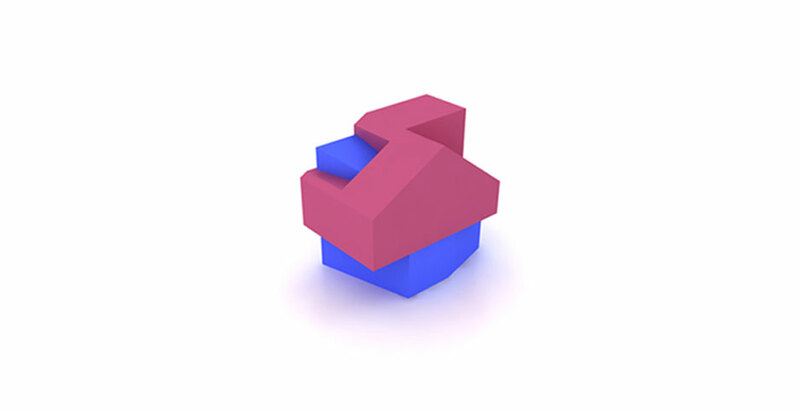 The floor plan of services is grouped near the shaft and near the central core for economic optimization of the plant exhaust and supply of all levels. The inhabitants of these buildings have access to a large green area of the roof garden above the parking plaques. 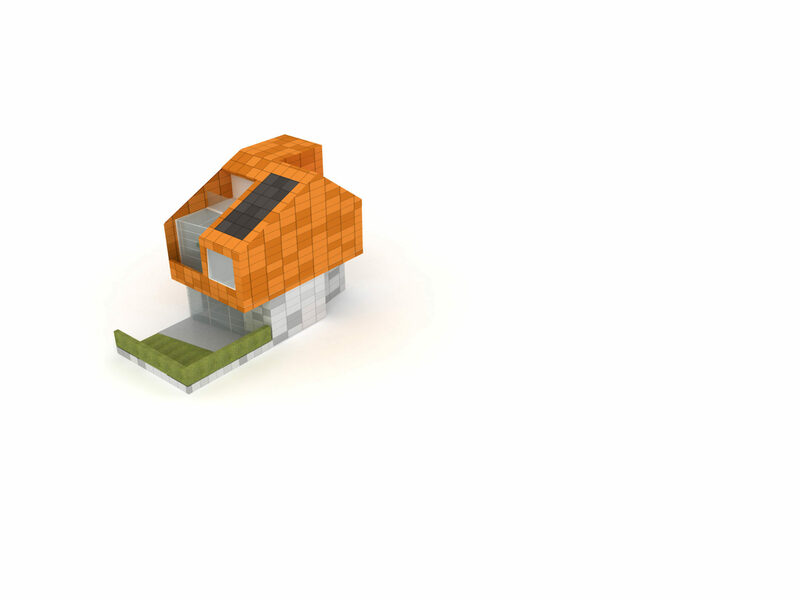 The second main type of housing is made of low houses, they are arranged on two floors plus an attic space. On the ground floor are present services, kitchen and living room overlooking a large private garden, while the upper floor consists of rooms and services. 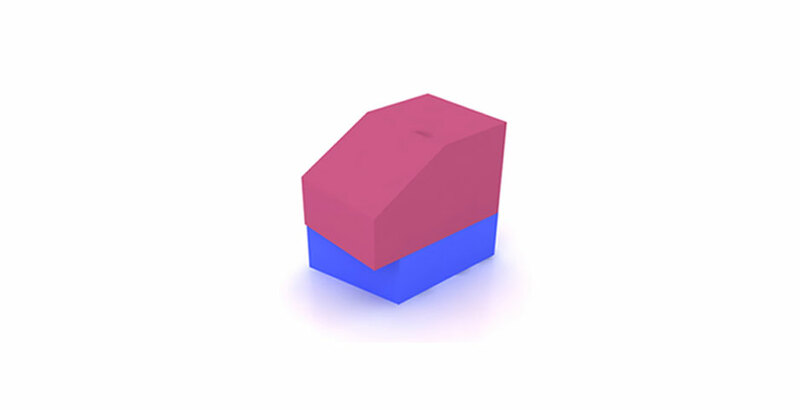 The third type is a hinge between the two previous types. They are placed on residential houses, lined up on the third floor and are directly linked with the car park through walkway at a height of 6 meters. 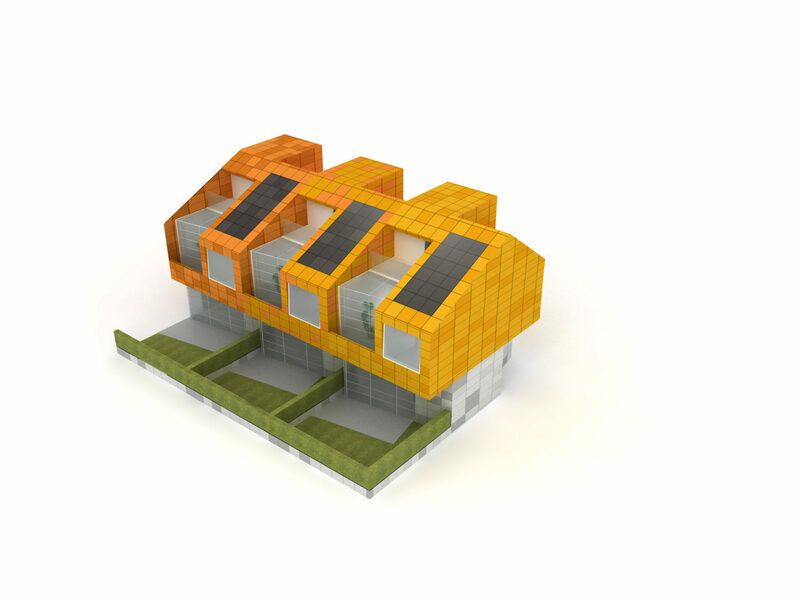 They are on one floor and are positioned on two modules of low houses. 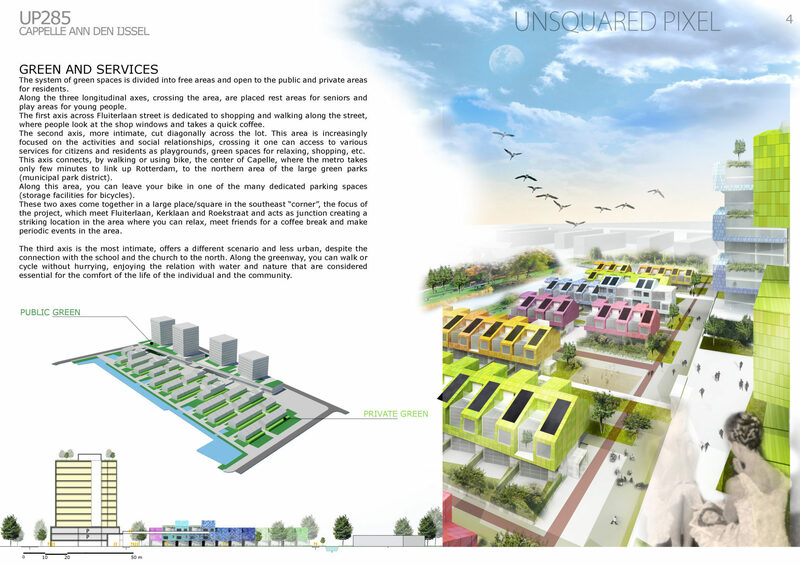 Even these houses are for saving and energy production. The external surface treatment of these homes offer greater transparency, through the windows and verandas facing south and low permeability northerly, for more comfort during the different seasons and to reduce the use of artificial light during the day, the position of the roof and opaque parts is modulated according to the weather and the seasonal inclination of the sun to heat up and shade environments of everyday life. 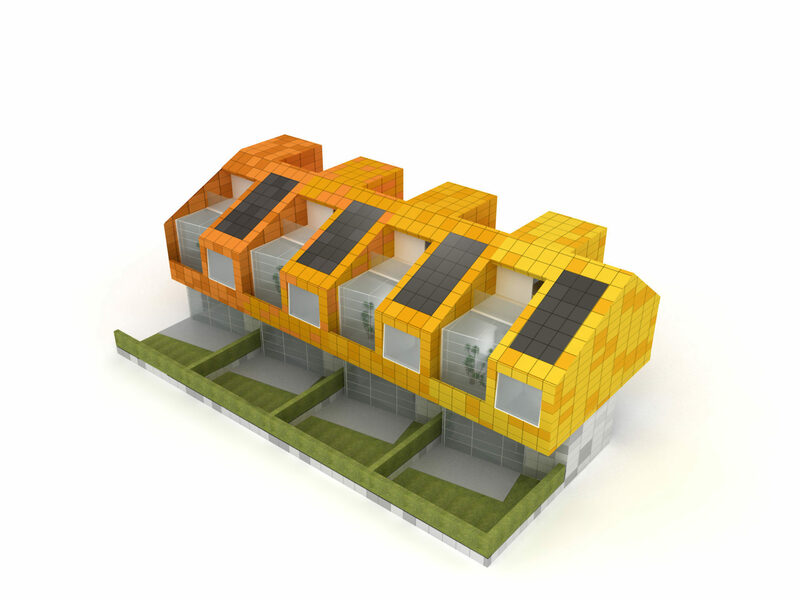 The houses are energetically assisted by the surfaces of roofs covered with photovoltaic panels for electricity. 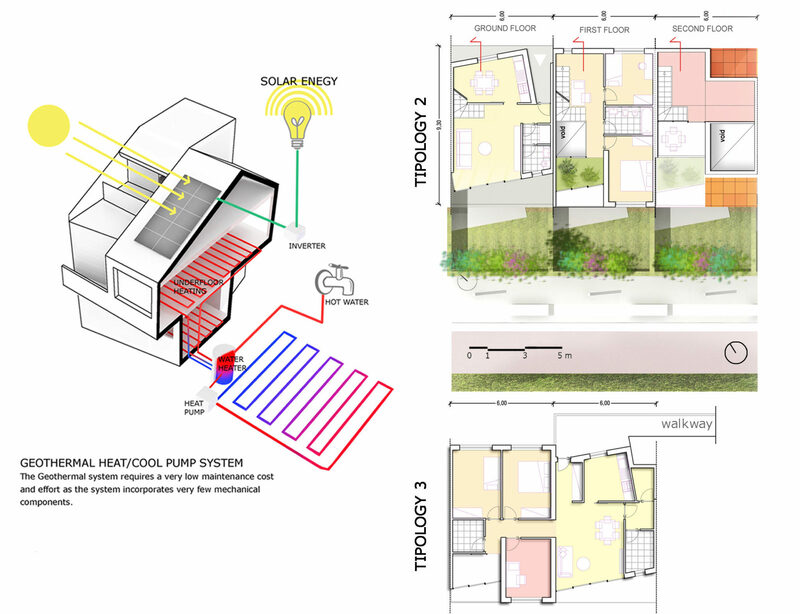 It also planned a geothermal system that uses ground temperature to preheat water used for heating in winter and refreshing in summer the various floors and water. The system provides coil on the floor at low temperatures. 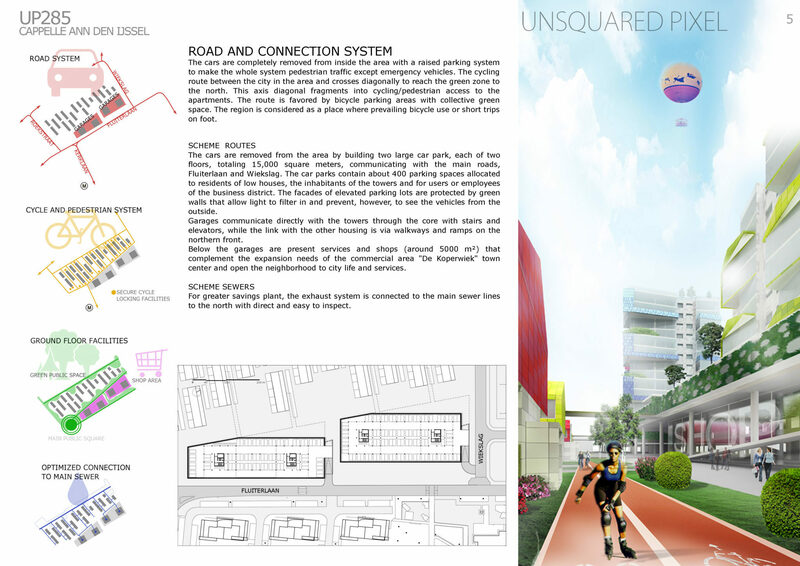 The project concept was created by the overlap of the two prevailing directions that dominate the adjacent urban system and pursuing directions that converge and intersect in the area Hoven 2. 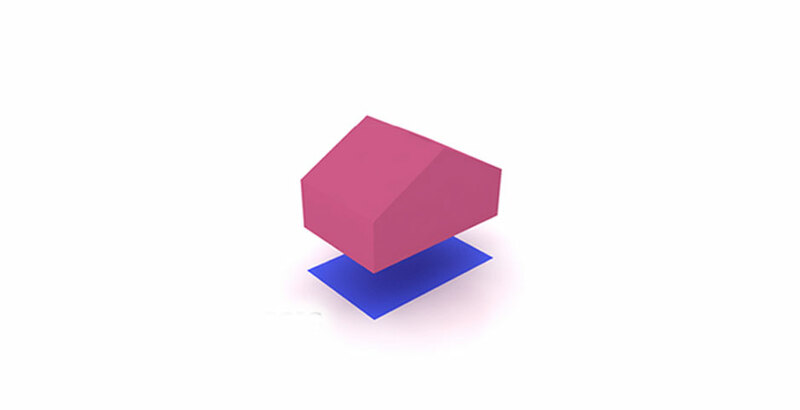 The grid which is generated breaks the idea of a square meter, of a pre stabilized module 1×1, of a pixel. From the breakdown of the rule is born the word “unsquared”. 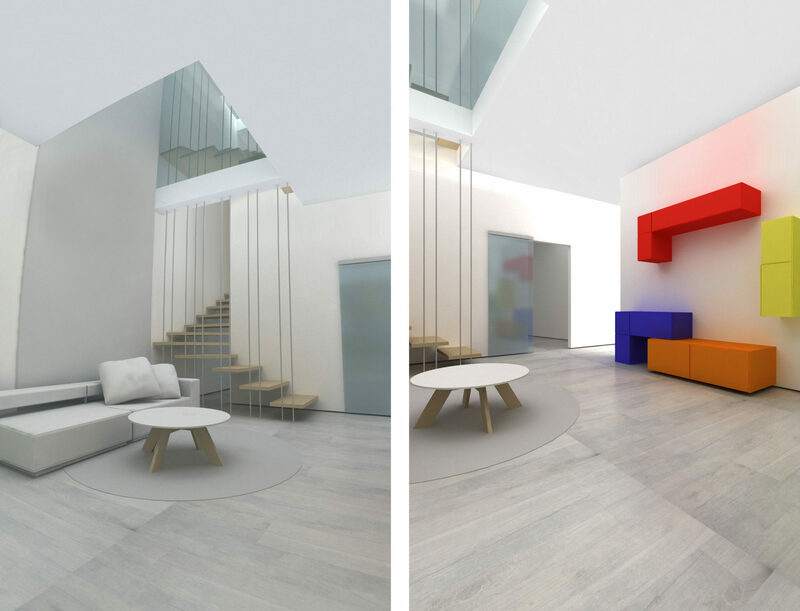 The coating chosen for the facades, a system of multi-colored prefabricated element.